Last month the team attended the Hearing Voices World Congress in the Hague, Netherlands. We attended workshops and delivered some of our own. One of the workshops our development worker Jessica Pons held was called ‘Voices, Visions and Borderline Personality Disorder (BPD) – whose story counts?’. Within our work with women in prison and forensic Hearing Voices groups, we come across many women who hear voices and have received a diagnosis of Borderline Personality Disorder/Emotionally Unstable Personality Disorder. The diagnosis is incredibly controversial for a number of reasons. Many women feel it’s invalidating, or retraumatising, and can impact how they are believed, perceived and treated by professionals. Women with this diagnosis are sometimes told that voices they hear are ‘pseudo-hallucinations’. In the workshop, we explored how this framing might affect how women understand, speak and relate to their experiences. We also thought about the effect it can have on staff, and how it might affect their ability to hear and support these women. Finally, we put to the group whether we needed to hear more about this diagnosis within the Hearing Voices Movement. Towards the end of September, Mind in Camden hosted Flick Grey’s workshop ‘Deconstructing Borderline Personality Disorder’. She spoke about how BPD is a label applied predominantly to women, many of whom are survivors of childhood sexual assault, family violence or other overwhelmingly distressing interpersonal experiences. The workshop challenged the pathologizing, de-contextualizing and individualizing concept of “personality disorders” and explored more generative ways in which experiences labelled BPD can be understood – in terms of mis-attuned, disavowed and invalidating relational environments, as creative adaptations and/or (valuable) relational sensitivities. Both Flick Grey’s training and Jessica’s workshop were fully attended and received positive reviews. We now plan to talk more explicitly about the impact of a BPD diagnosis within our training and materials. Thinking back to the history of the Hearing Voices Movement, it makes sense that there has been more reflection on the impact of schizophrenia and psychosis. We now think it is now time to hear more about people’s lived experience of the diagnosis Borderline Personality Disorder in the context of hearing voices, having strong beliefs and other non-shared sensory experiences. We are due to hold a BPD workshop later this month for female service-users on a forensic ward in Essex. We’ll then begin developing a one-day training on BPD to be delivered in February 2019. Photograph taken at the end of the ‘Voices, Visions and Borderline Personality Disorder’ workshop at the 10th World Hearing Voices Congress. 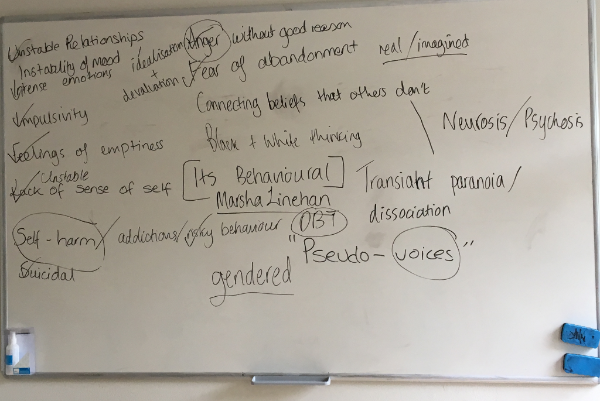 We’d noted down the DSM categories and begun to unpack, critique and think about how we might talk about the impact of this diagnosis in Hearing Voices Groups.